There is no doubt that restoring a century old home to its former glory can be a costly endeavor replete with unexpected complications and diversions. And it is just for this reason that many homeowner's choose to work with an experienced architectural firm or interior designer to ensure that the project is undertaken with a significant consideration for the home's traditional detailing and design. This 1890's Barrington farmhouse is an excellent example of the type of renovation indicated above. No detail was left out when the homeowner's decided to renovate. Working with the notable Brewster Thornton Group Architects the home was restored with many custom features designed to appear original. The home's exterior siding was removed and its place clear red cedar clapboard siding was installed and painted in a striking black and white combination. The porch railings are a custom reproduction of the original baluster pattern. Just inside the front door, the custom staircase, with its mahogany newel and baluster handrail was designed to reflect 1890's architecture. New additions such as a master suite and bathroom continue in the same style as the rest of the home while adding much-needed private space for the family. The installation of reclaimed pine floors pairs beautifully with the home's vintage vibe. Last, but not least, a two-car garage designed to match the home's exterior provides plenty of storage options, as well as a second-floor game room. 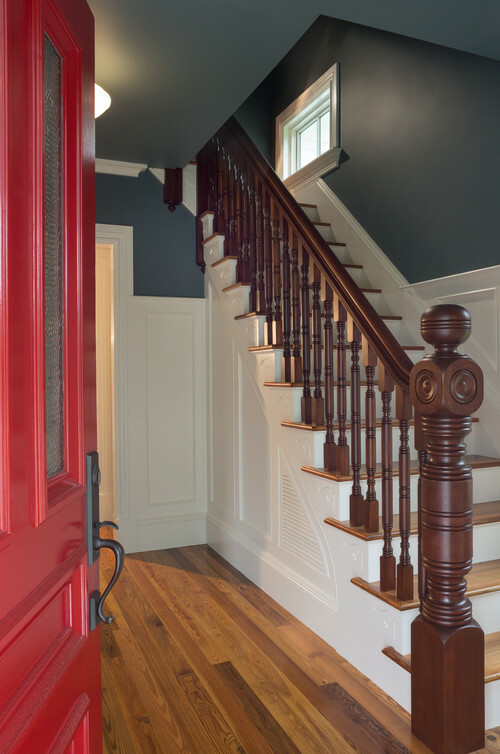 The gorgeous woodwork and custom detailing in the entrance sets the stage for the remainder of the home's design. 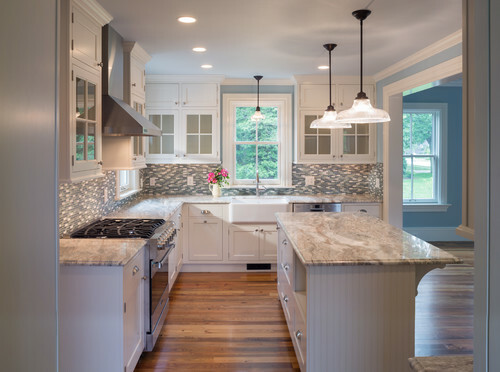 The spacious farmhouse kitchen features Shaker-style cabinetry, beadboard details and a roomy island/breakfast bar. 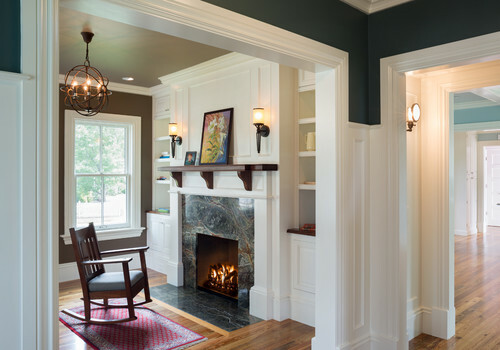 The contrast between the white trim and dark wall color draws extra attention to the home's detailed woodwork. 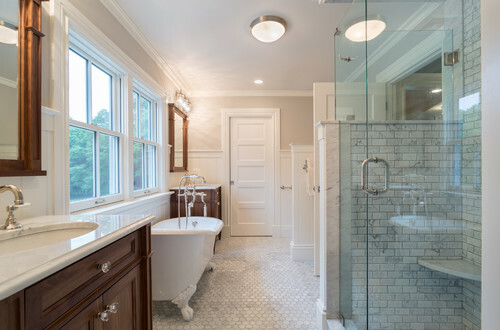 The master ensuite has been outfitted with Carrara marble tiles, custom vanities and a clawfoot tub. 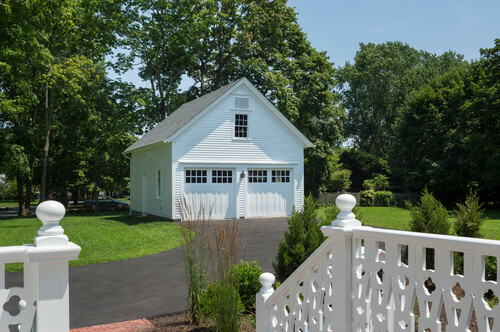 Tucked behind the home, a one-and-a-half story garage provides a place to park the car and store out-of-the-way items. 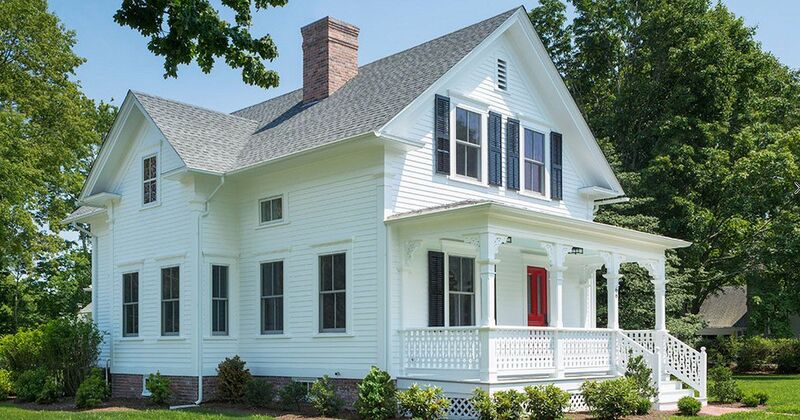 Don't let your friends miss out on the classic charm of this newly-renovated Barrington farmhouse and take a moment to share it with them on Facebook.